As you all know we love to encourage the idea of bringing a little ‘you’ into your day, this can be done in so many ways but one of the more obvious choices is to select a venue that reflects your personality! Now, this collection isn’t going to ‘float everyone’s boat’ so to speak, some of you will find these ideas incredible, others wouldn’t even dream of holding their wedding in these places, but that’s what it’s all about! Every single one of you is unique and this list has been created to inspire the socks off you! Of course, depending upon what country you’re in, some places won’t have a licence to hold a wedding but it’s always worth researching into having your reception there if you really love it! Beautiful lighting, a calm atmosphere & lots of colourful fish surrounding you, it would be perfect for the water lovers out there! Alternatively if you really love water that much you could consider getting married under it! If you’re a fan of sport then imagine how spectacular it would be to have your reception/wedding or at least a few photos at your favourite teams stadium! This particular photo was taken at the Grand Canyon, we can only imagine how breath taking it would have been! The Eiffel Tower, Big Ben, Taj Mahal, Stone Henge….the list goes on! Take your pick! Dress it up spooky or dress it up classy! A wedding in a cave would be incredibly cool…not to mention creative! How spectacular it would be to be surrounded by marvelous mountains on your wedding day! For the history and art lovers, why not get married or have your reception in a museum? Your guests would never have a dull moment! Eek! A carnival wedding would be ridiculously fun! Forest weddings are particularly close to our hearts, we love how simple they can be or how beautifully decorated they can be! We’re thinking fairy lights & wooden tables for your guests! Two of our friends had a stunning wedding in a church followed by a reception held in their very own garden, it couldn’t have been more special or personal and all of the DIY details tied everything together beautifully. If you and your hubby share a passion for reading then a wedding or reception in a library could be perfect! How romantic it would be to be married at sea! Or for a more intimate ceremony at sea you could always go with a sailboat! Ohhhh the fun of getting married at a theme park! 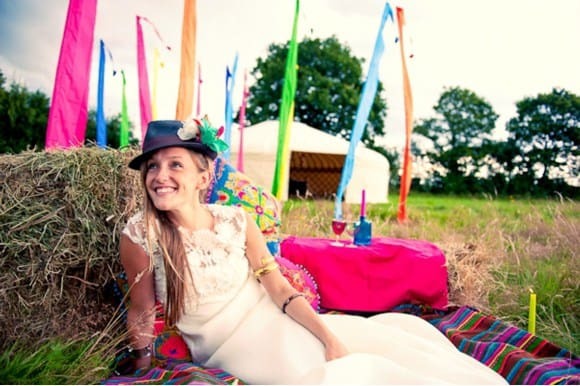 The idea of a festival wedding sounds ultra fun, particularly for us English girls where festivals are an ultimate summer past time! For a complete contrast how about a rooftop wedding overlooking a gorgeous cityscape. IMAGINE! A wedding on safari or at a zoo?! This couple proved how beautiful the images and we’re sure..the memories of such a unique wedding could be. We’re certain wherever you choose to hold your special day will be just as special as you! I love the wedding dress in the library photo. I would like some advice. I have just learnt that in the UK you can only get married in a register office or other location, e.g. church, if you have lived in the registration district for at least 7 days or 8 nights immediately before giving notice of marriage at the Register Office. So, within England, there is a problem if you wish to marry at a location 50 miles or more away from where you live. Could you advise me how couples manage to marry at all these fantastic locations around the UK? Do they have their marriage ceremony in the location of their choosing then sign the register at another ceremony at their local Registry office? Hi Carol your are right that you have to have lived in the registration district for at least 7 days, 8 nights before giving notice of marriage at the relevant register office so many couples get round this by signing the legal documents at their local registry office prior to the ceremony, then holding the ceremony at a location of their choice and using a celebrant to take the service. You might find this post helpful https://www.bespoke-bride.com/2012/12/04/one-life-weddings-guide-to-woodland-weddings/. I hope that has helped and good luck with your search! Great article! Using it on my Navy Wives & Girlfriends blog for a post on affordable weddings. I noticed that more Brides nowadays do weddings in the garden. Completely customised as you would wish. Personally a woodland wedding is my favourite. Lovely photos by the way! LOVE these ideas! We have a lot of great rooftop wedding venues in Portland. Wow, you weren’t kidding when you said these venues were unique— I wouldn’t have thought of half of these! However, I do have to say that the idea of getting married in the mountains sounds absolutely amazing. It would be SO gorgeous to just be surrounded by nature like that! However, I feel like it would also be really hard to haul all of the furniture you’d need to a place like that!